Already boasting of extensive features, the Isuzu mu-X exceeds any discerning customer’s expectation. 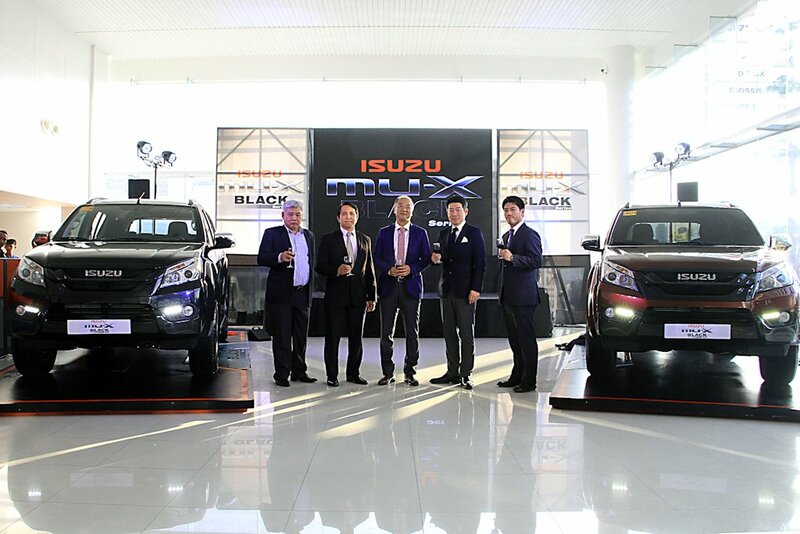 Now, Isuzu Philippines’s flagship SUV offers even more as a new variant is introduced: the Isuzu mu-X Black Series. 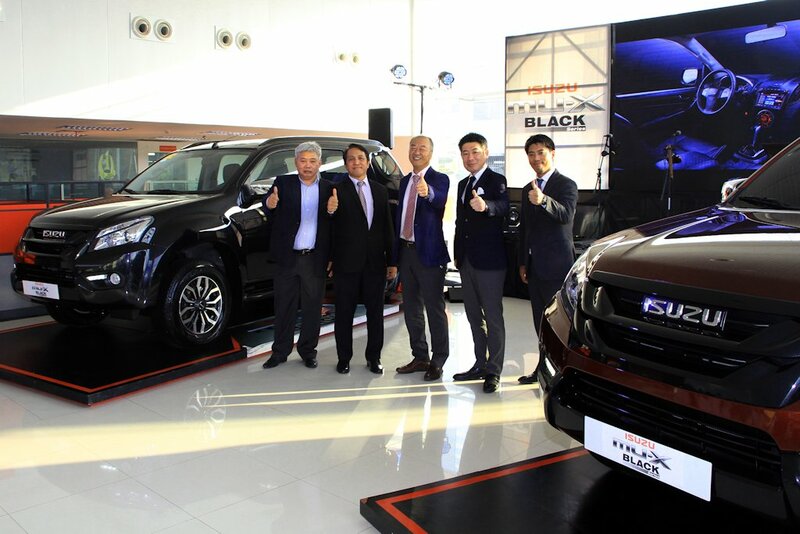 Isuzu Philippines Corporation officially upgraded the Black Series at Isuzu Cebu two days ago. Based on the mu-X 3.0 LS-A 4x2 A/T, the Black Series carries additional styling and functional features. As its name implies, this special mu-X offers blacked out exterior trims namely on the radiator grille and hood garnish. The front bumper also offers a two-tone finish with the lower part finished in Cosmic Black. Further bolstering the dark and more daring look of the mu-X Black Series, it also gets gloss black roof rails which can carry loads up to 60 kilograms and semi-gloss black side step boards. At the back, a new tailgate garnish, also finished in black, updates the styling. The exterior changes are capped off by the re-designed two-tone 17-inch aluminum alloy wheels shod with 255/65 R 17 tires. The changes extend to the Isuzu mu-X Black Series’ interior where added carbon fiber accents on the key cover and other panels including the scuff plates add sportiness. Adding to its sophisticated feel are chrome garnishes on the inside door handles as well as soft padded door arm rests and center console. Also new is the organizer box at the back, which complements the various storage compartments already found in the mu-X. The Isuzu mu-X Black Series also boasts of projector-type multi-reflector headlamps, daytime running lamps, a center-mounted roof antenna, chrome power-folding side-view mirrors with integrated turn indicators, and a rear spoiler. Inside the vehicle are upscale devices like an entertainment system with Bluetooth, iPod, and WiFi connectivity. It also has an 8-inch touchscreen display for the various multimedia functions and the navigation system. Other features include the electroluminescent multi-information display, 10-inch ceiling-mounted video monitor, six-speaker system, leather-wrapped steering wheel, and 6-way power adjust driver seats that are also covered in leather. “As Isuzu Philippines’ bestselling and flagship model, the Isuzu mu-X Black Series deserves to have the best features that address the expectations of even more discerning customers. That is why we strive to continually introduce upgrades to this premium and highly capable SUV. 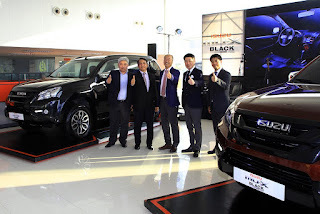 The Isuzu mu-X Black Series is the latest product of such efforts, and we’re confident that the model will appeal to a more sophisticated market,” said IPC Executive Vice President Shojiro Sakoda. “Introducing the new Isuzu mu-X Black Series in Cebu is also an important move as this signifies Isuzu Philippines’ appreciation for growth markets in the central and southern parts of the country. And Cebu has consistently been among the strongest performers in terms of deliveries of Isuzu products,” Sakoda added. Mechanically, the mu-X Black Series is powered by Isuzu’s 3.0-liter 4JJ1-TC (HI) diesel engine. Equipped with common rail direct injection and a variable geometry turbo, it produces 163 horsepower and 380 Nm of torque. Power is then routed through the rear wheels via a 5-speed automatic with a sequential shift function. 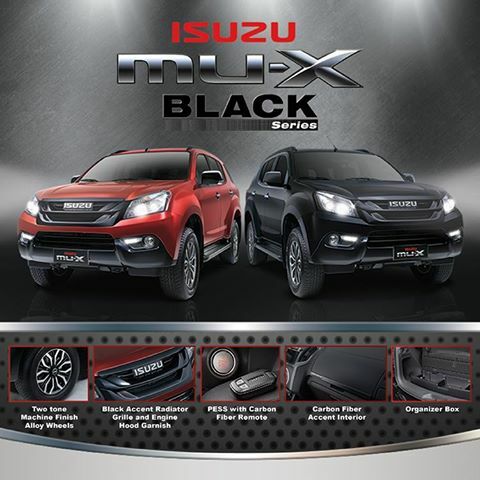 The Isuzu mu-X Black Series is priced at P 1,568,000, and is offered in two colors, namely Cosmic Black and Garnet Red. It is now available at all authorized Isuzu Philippines Corporation dealers and satellite branches nationwide. Is this Black Series of Isuzu's the counterpart of Toyota's TRD as a smoke signal that a new model is coming out in the coming months? I'm currently torn between the Mitsu Montero, Ford Everest, Chevy Trailblazer, and MU-X, I'll be buying this coming December 2017. May I have the pros and cons aside from the things I read in the internet, I would hope that it would be solely based on experience, but opinions can also help me decide. I'm looking for low maintenance in a vehicle, but with reliable after sales, and not the least a good powerplant.